Last weekend, 50,000 people flooded the streets of France for the first protest of 2019 organized by the yellow vests, or gilets jaunes. This protest is a continuation of a national movement for economic justice that has shaken the country since November. While mainstream French and international media have largely characterized the yellow vests as violent troublemakers, many people throughout France see the movement as a long-needed popular uprising against a deeply unjust political and economic system.Videos on social media depict these protesters in a different light: giving hugs and handshakes to police officers on New Year’s Eve, turning demonstrations into parties, and dancing cheek-to-cheek as the police forcibly evict a protest camp. 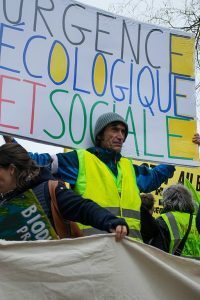 These scenes paint a different picture of the yellow vests as a largely nonviolent grassroots movement.As with many decentralized and less structured movements, the yellow vest movement has attracted a diverse cross-section of French society, from the far-left to the far-right and from high school students to pensioners. While the movement has unleashed a tidal wave of discontent and anger throughout France, it also has the potential to re-invent French politics as a participatory process, putting ordinary citizens back in control. Yellow vest protesters in Belfort, France in November 2018. Despite these issues, a clear political line has emerged — one with a set of demandsprimarily focusing on economic justice. This includes establishing a more progressive income tax and making large corporations like Google, Amazon and Carrefour pay their fair share of taxes, while supporting small businesses. But many demands also call for an end to the continuous gutting of public services: ending the closure of bus and train lines, schools, maternity wards, post offices, and re-nationalizing recently privatized public services like gas and electricity.